Perfection is rarely duplicated. 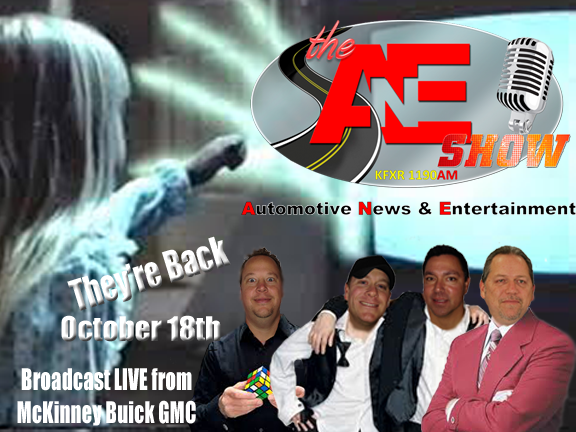 However, October 18th live from McKinney Buick GMC; the boys from The ANE Show will once again dominate the airwaves with the most talked about Automotive, News and Entertainment radio show in the Dallas and Fort Worth area. After a brief hiatus, (rumor has it that Doc was renegotiating a long-term deal) Jim “Doc” Proctor, The Guru Josh Deaton, Jeff “Bubba” Thompson and James “The Spin Doctor” Schaefer will pick up the mic every Saturday morning at 9 AM on Clear Channel Radio’s 1190 AM. The show is not your typical radio talk show. There is a definite purpose to the hour long program. The ANE Show which stands for “Automotive, News, and Entertainment” provides information for consumers and dealerships alike helping listeners find the right vehicle for their needs. However, the show doesn’t take the typical approach to just providing the same information about the automotive industry every week. Each week, listeners will be able to interact with the cast of characters through social media as well as visit with this team live on location. The “Doc” and “Bubba” have spent many years in the automotive industry helping put car buyers in the right vehicle. They built a great reputation for providing great vehicles for fair prices, and even more for going the extra mile to make buyers happy. “The Guru” and “Spin Doctor” created a patent-pending digital marketing company (DeliveryMaxx) that blends social media and online reputation to help any company, organization, or person that utilizes the web to share or sell their products or services. Combined, listeners will be able to understand the automotive industry learning how best to buy vehicles as well as keep up with the latest industry news. In addition to being informed about the automotive industry, real world news, sports and entertainment will be discussed during the show. There will be plenty of opinions and fun to be had every Saturday morning. You can tune in at 9 AM every Saturday Morning to 1190 AM and follow The ANE Show on Facebook or Twitter @theANEshow to be part of the conversation. Just write your questions or comments into the timeline and hear how the cast responds.